No time for the Kentucky Derby? 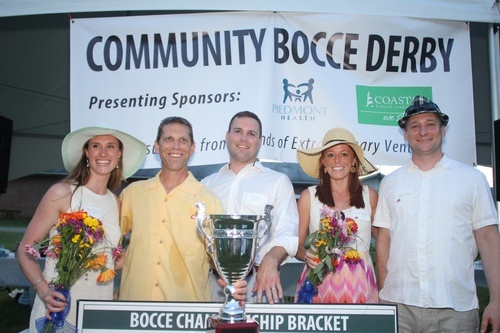 We're bringing the Bocce Derby to you! Bust out your best sun dress, your biggest hat, and your snazziest madras because it's time for the Community Bocce Derby! Enjoy a fun filled afternoon of bocce, mint juleps and BBQ with local business leaders and Chamber members! See photos from last year. Buy a team for you and a date/friend/client/colleague or buy a few as a team-building outing for the office! In 2015, the tournament was renamed after our wonderful friend, Chris Derby, former bocce champion, Chamber board member and leader within the local business community. *Take $20 off your team and $10 off an individual player when you register before March 20! $25 SuperFan Tickets (Prefer to cheer instead of play? Enjoy all of the eats, drinks, and goodies and compete in the Best Derby Duds contest as a SuperFan!